The Los Angeles Opera opening night audience appeared to love it. 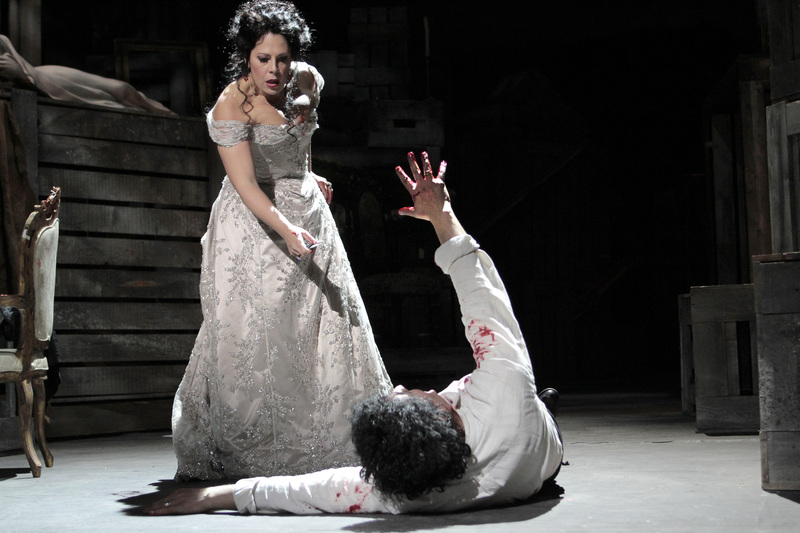 Every moment of Floria Tosca’s obsessively jealous behavior evoked an appreciative response, mostly laughter of course — for La Tosca‘s treatment of her boyfriend, the painter Mario Cavaradossi, is indeed comically irritating. Everyone was clearly following the supertitles closely. The emergence and reemergence in the pit of conductor Plácido Domingo leading the Los Angeles Opera orchestra elicited endless delight. Perhaps the only totally inappropriate response came at the moment of Baron Scarpia’s bloody demise: the laughter was definitely out of place at this juncture. In general, however, the crowd reacted as if they were experiencing Giacomo Puccini’s familiar overheated melodrama for the very first time. They made their appreciation for the diva, soprano Sondra Radvanovsky, abundantly clear; and they showed their admiration for the villain Scarpia, baritone Lado Ataneli, by mixing in some good-natured boos with the cheers; and they awarded tenor Marco Berti a much heartier welcome than he may have deserved. If points had been awarded, however, Radvanovsky would have accumulated the lion’s share. With the mise en scene and costumes (Bunny Christie) updated to World War I, or so it seemed to me (I thought Scarpia looked a bit like Puccini who died in 1924), this was one of the ugliest productions I have seen in some time, and the stage direction (John Caird, he of Les Misérables fame) was full of sophomoric innovations. A Mini-Me version of Tosca (pace Austin Powers) made numerous unwelcome ghostly intrusions, especially when she unsuccessfully substituted for the famous Shepherd whose haunting song helps characterize the opening of Act Three. Apparently lured to it by Mini-Me, Tosca slits her own throat before leaping from what is often the Castel Sant’Angeleo (at least in the composer’s original intentions) but here appeared to be an all-purpose execution chamber perfect for shootings and hangings and lacking only an electric chair. The often elegant Act Two Palazzo Farnese, Baron Scarpia’s apartment, looked almost precisely like the loot-filled expanses of Xanadu in the final moments of Orson Welles’ Citizen Kane: miles and miles of crates and classic statuary. I gather Scarpia was collecting Canovas, Berninis, and even a Michelangelo captive. It was rather fun trying to figure out what all the artwork was supposed to be. We first see the basic unit set in Act One where it is supposed to serve as the Church of Sant’Andrea delle Valle. In perspective it is a pie-shaped bombed-out shell with a gaping hole in the ceiling and high-placed window-like openings all around. The painter Cavaradossi’s famous scaffolding props up three gigantic and unalluring fragments of his supposed portrait of Mary Magdalene. Singing “Recondite armonia” from the top of this structure created some awkward synchronization problems for tenor Barti vis-à-vis the vocal/orchestral blend, and he was clearly nervous. Frankly, I felt there was a disconnect all evening between the vocal and orchestral elements, scaffolding or no. The whole performance seemed as if it needed more rehearsal: singers and orchestra were very often not perfectly together. Berti has the large ringing sound one loves to hear from Italians, but he seemed a little off his game, perhaps because of the odd physical production. “E lucevan le stelle” needed more depth of feeling; it came off as way less than heartfelt and was unaided by any visual component more romantic than a small square view of dimly shimmering stars at the back of the stage. The suffocating environment may have suffocated the singer. 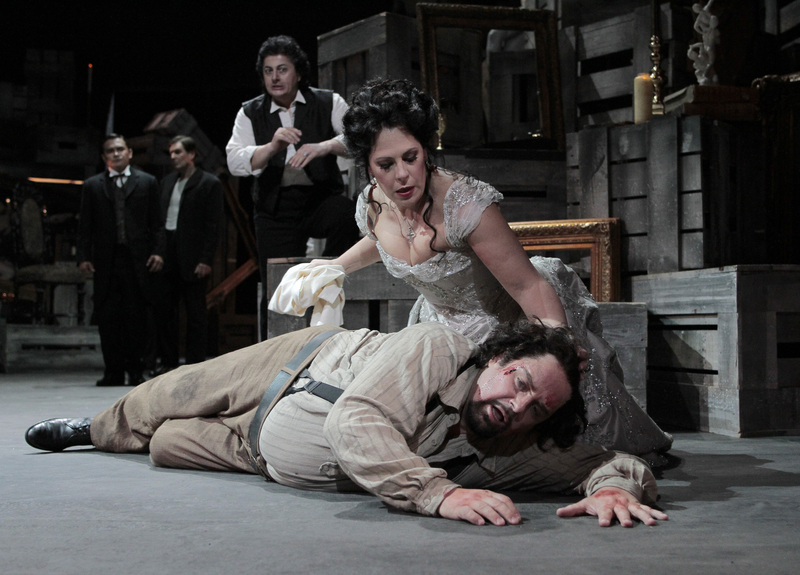 Baritone Lado Ataneli has a gorgeous voice, but it is not dark enough for Scarpia, and Ataneli does little to give the voice a villainous edge. He comes off as much too charming. I have heard this singer several times before and I want to hear him again, but not in this role. Radvanovsky can be so phenomenally loud at times that everyone else sounds as if they are not singing. Her voice is richly textured with a complex timbre — and it is not to everyone’s taste. I am reminded of the classic disagreement as to whether Maria Callas had a beautiful voice or not. When Radvonovsky forces it to top volume, the sound is ugly to me. I also feel she externalizes as an actress and we are not aware of much internal life. I felt the presence of a major artist, but I was not moved by anything, including the “Vissi d’arte.” That said, there is no question that Radvanovsky is the chief reason to see this current Tosca. My opinion of the diva is deep, deep down in a tiny minority section. 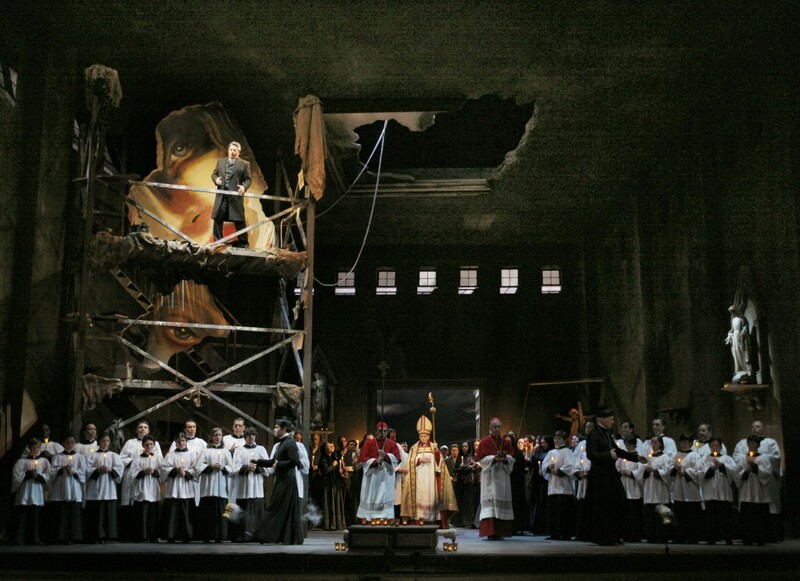 Bass Joshua Bloom, by the way, makes an excellent Angelotti, bass-baritone Philip Cokorinos an engaging Sacristan, and tenor Rodell Rosel a fine Spoletta. Grant Gershon’s choral work is excellent as usual, and lighting designer Duane Schuler deserves praise for making a dark and gloomy set actually visible. Production from the Houston Grand Opera. Production new to Los Angeles.